Two is nice, three is even better. The Hitmen head into Friday’s matchup against the Swift Current Broncos looking for their third straight win after a pair of home victories last weekend. During a three-in-three weekend, the Hitmen ended with a 2-1 mark, with a 4-3 overtime win over the Oil Kings and most recently a 5-1 win over Moose Jaw Sunday afternoon. 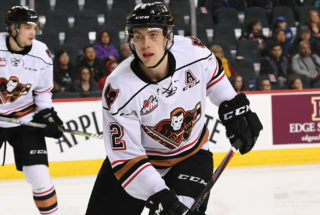 In the win against the Warriors, Kaden Elder and James Malm both scored twice for the Hitmen who snapped Moose Jaw’s eight game winning streak. Egor Zamula also lit the lamp for the home side, while Jack McNaughton made 33 saves, including 17 in the third period to preserve the win. 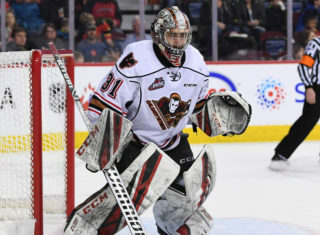 Friday marks the first of four meetings between the Hitmen and Broncos, Calgary went 1-2-0-1 against the defending WHL Champions last season despite outscoring them by a combined 13-12. Jake Kryski (1G, 6A) led all Hitmen with seven points in the season series. The next meeting between the clubs won’t be until Jan. 30 in Swift Current. Tuesday night saw the Broncos snap a three-game losing streak as they took down the Prince Albert Raiders 3-2 in a shootout. 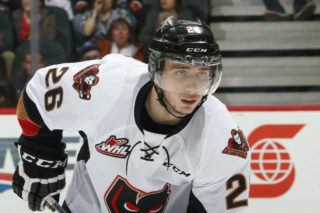 Former Hitmen Andrew Fyten will once again return to Calgary where he played 155 career games with the Hitmen and currently sits second in team scoring. 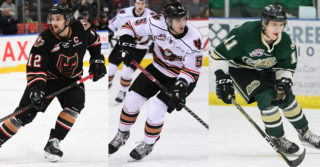 A trio of Hitmen also have ties to the Broncos as Riley Stotts and Kaden Elder both suited up for the boys from Speedy Creek while Josh Prokop was drafted in the fifth round of the 2015 WHL Bantam Draft by the Broncos. With two games in hand and sitting four points back of Medicine Hat for a wildcard spot, the Hitmen will look to get into a tie with the Tigers with the two tilts this weekend. “As a group we have taken a step forward,” head coach Steve Hamilton said. “We’re building the fine line between panic and poise and having the right amount of patience in critical situations. 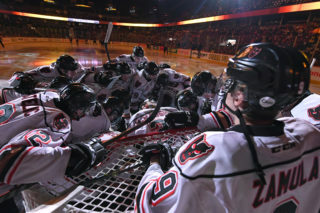 Sunday afternoon will see the Hitmen take on Kamloops for the annual The Brick Teddy Bear Toss Game. Fans are asked to bring as many bears as they can to reach the 35,000 goal. For every bear collected, The Brick will donate 25 cents to the Alberta Children’s Hospital Foundation. Kaden Elder (3G, 3A) and Mark Kastelic (1G, 2A) are both riding three-game point streaks. Jack McNaughton has won his last two starts stopping 59 of 63 shots for a .937 save percentage. Kaden Elder is one away from 50. Jake Kryski needs two points for 200 while James Malm is three points shy of 150. Layne Toder and Egor Zamula are both two games away from 100.